You work hard for a living, but can you say the same for your body? Do you work hard enough for yourself? Look at yourself in the mirror. What do you see? Are you hidden behind baggy clothes that cover the fat figure of yourself? You spent all these years working so hard and making money. You spent no time caring for yourself and the result is what you see in the mirror. After working eight hours a day it can be difficult to have the energy to workout. But there should be something you should do to prevent the bad consequences of your sedentary lifestyle. Sedentary lifestyle not only causes overweight problems but also bring about health issues. So, get moving and put an end to your sedentary lifestyle. You can exercise and work without neglecting your duties. Make the effort to move around within the office. You need not be seated at the table all day long. Get up and walk around. Go to your colleague’s table for getting information or just for a chat. If you need data from another section, do not just speak over the intercom or send an email asking for it. Instead walk to the particular section and ask for the specific data or file. This way you get to move and also build a relationship with the rest of the staff in the office. If you find yourself sitting at your table too long, start fidgeting. Is fidgeting an exercise? Yes, it is. When you fidget you naturally tend to move your body parts and expend energy on it, right? So it would amount to exercising. If you do not like to fidget then consider rearranging your table or the stuff in the drawers. You can do it daily if you want and who can stop you doing so? Use lunch break to have a quick meal and then go for a walk. Step out of your cubicle; go out of the office environs. You will get fresh air which will do you a world of good. Climb a few flights of stairs daily. If possible do not take the elevator to the office floor, instead use the stairs. If you do this every day you will burn a lot of fat quickly. Buy a belt using flex belt coupon and start using it. Walk to your work place if the distance is not much from home. If you take a bus then get down at the previous stop of the office and walk the distance. If you drive to work park your car as farther as possible you can from the office entrance. If you need to make an official phone call, stand while talking. Standing is better than sitting. You spend more energy while standing than you are seated. While at the desk do a few exercises that can be done seated. Don’t bother about others watching, they’ll follow you soon. Flex your shoulder muscles, rotate your wrists and draw the figure 8 with your feet. 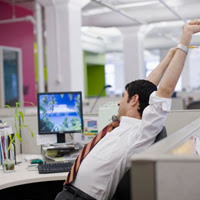 Follow these tips to end your sedentary lifestyle and feel the difference! Writing for The Flex Belt Reviews where owning Flex Belt is an asset for people who are conscious about their abdomen and want to have a toned and firm abdominal region.